The four algorithms of Llull's Ars. Ramon Llull, T.O.S.F. 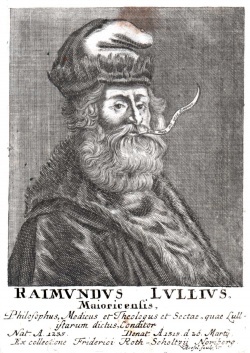 (1232–1316; Anglicised Raymond Lully, Raymond Lull; in Latin Raimundus or Raymundus Lullus or Lullius) was a Majorcan writer and philosopher, logician and a Franciscan tertiary. From the 1270s onwards Llull worked on his Ars [Art]: a philosophico-theological system which takes the basic concepts of the three monotheistic religions of its time and discusses them by means of rational discourse. Revising his Ars and extending it across all fields of human knowledge, Llull attempted to create a universal science that later influenced thinkers such as Nicholas of Cusa and Leibniz. He produced some 280 works in Catalan, Latin, French, Italian, Occitan, and Castillian. In the 1960s, Llull's employment of combinatorics and algorithms also found resonance in the poetics of literary group Oulipo (see Cramer 2005 and Cramer 2011). Several authors have pointed out that the model for Llull's mechanisms was a divinatory device called a za'irjah (see Link 2010). 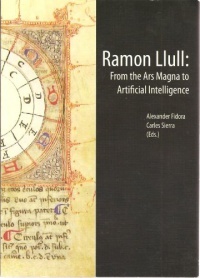 From Ramon Llull: From the Ars Magna to Artificial Intelligence, eds. Alexander Fidora and Carles Sierra, 2011, pp 139-140. 1229: James I reconquers Mallorca. 1232: Birth of Ramon Llull in Palma de Mallorca. 1257: Llull marries Blanca Picany, and enters the services of Prince James, son of James the Conqueror. 1263: Llull’s “conversion to penitence” at the age of thirty: Llull decides to write the best book in the world against the errors of the unbelivers, to found monasteries in which the different languages necessary for mission might be taught and to dedicate his life to the service of Christ. 1265: After a pilgrimage to the Marian shrine at Rocamadour, in southern France, and to Santiago de Compostela, Llull meets with Ramon de Penyafort in Barcelona, who advises him to return to Majorca and there, rather than in Paris, to devote himself to study and contemplation. With a Muslim slave Llull begins nine years of linguistic and intellectual training. 1271-74: At the end of his nine years of study, Llull writes his first works, the Lògica d'Algatzell — a paraphrase of al-Ghazali's Maqasid al-falasifa, and the monumental Book of Contemplation. 1274: Death of the slave who had taught Llull Arabic. Illumination on Mount Randa, first version of the Art, Llull's philosophico-theological system. 1276: A Papal Bull confirms the foundation of the Monastery of Miramar, on Majorca, financed by James II, in which thirteen Franciscans study oriental languages and the Art. 1283: In Montpellier, Llull writes the novel Blaquerna and elaborates upon his system in the Ars demonstrativa. 1287: First visit to the Papal Court. 1287-89: First visit to Paris. 1292: In Rome, Llull (already 60 years old) writes his first work on the crusades. 1293: So-called "psychological crisis" in Genoa followed by Llull's first journey to North Africa. 1297-99: Second stay in Paris. 1299: James II of Aragon gives persmission to Llull to preach in all the synagogues and mosques within his domains. 1301-02: Journey to Cyprus, Lesser Armenia and possibly Jerusalem. 1303: Llull writes his Logica nova in Genoa. 1305: Llull begins the definitive formulation of his system, the Ars generalis ultima. 1307: Second trip to North Africa (Bejaia), where Llull is imprisoned for six months and, finally, expelled. Shipwrecked near Pisa. 1308: In Pisa Llull writes the Ars brevis, finishes the Ars generalis ultima, and re-writes the work begun in Bejaia and lost in the shipwreck, the Disputatio Raimundi christiani et Homeri saraceni. 1309-11: Fourth and final stay in Paris, where Llull writes some thirty works, most of them directed against the Latin Averroists. In 1310, forty Masters and Bachelors of the University of Paris sign a document approving the Ars brevis. From Paris he travels to Vienne, recommeding to the Council of Vienne the foundation of language schools. 1314-15: Third mission to North Africa (Tunis), where Llull dedicates works to the Sultan. His final works date from December 1315. 1316: Around or before March he dies on board the ship taking him back from Tunis to Majorca or in Majorca itself. Llull must have been 84 years old. His remains are burried in the Franciscan Monastery in Palma. II.A.19f Art of Contemplation. A short treatise concerning techniques for elevating the soul. III.80 Ars generalis ultima (AGU) [1305–8, Lyon-Pisa]. Known as Ars magna. 600+ digitised manuscripts at Raimundus-Lullus-Institut of U Freiburg. The Augsburg Web Edition of Llull's Electoral Writings, incl. translations. Selected Works of Ramón Llull, 2 vols., ed. & trans. Anthony Bonner, Princeton University Press, 1985, xxxix+1329 pp; abridged ed. as Doctor Illuminatus: A Ramon Llull Reader, ed. & trans. Anthony and Eve Bonner, Princeton University Press, 1994, 408 pp. (English) The 1994 edition includes Book of the Gentile and the Three Wise Men, the Ars brevis, The Book of the Lover and the Beloved, Book of the Beasts; as well as Bonner's "Historical Background and Life" at 1-44, "Llull's Thought" at 45-56, "Llull's Influence: The History of Lullism" at 57-71. Reviews: Walter W. Artus (Renaissance Quarterly, 1986), J.M. Sobré (Hispanic Review, 1986), John Dagenais (Speculum, 1987), S.G. Fernández-Corugedo (Mystics Quarterly, 1988), F. Domínguez (Journal of the History of Philosophy, 1988, DE). 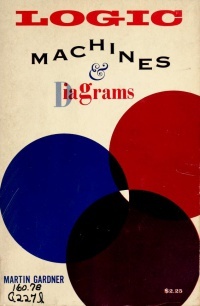 Martin Gardner, Logic Machines and Diagrams, 1958, Log, IA. Alexander Fidora, Carles Sierra (eds. ), Ramon Llull: From the Ars Magna to Artificial Intelligence, 2011, PDF. Frances Yates, "The Art of Ramon Lull: An Approach to it Through Lull's Theory of the Elements", Journal of the Warburg and Courtauld Institutes 17 (1954), pp 115-173; repr. in Yates, Collected Essays, 1: Lull & Bruno, Routledge, 1982. Martin Gardner, "The Ars Magna of Ramon Lull", in Gardner, Logic Machines and Diagrams, McGraw-Hill, 1958, pp 1-27; 2nd ed., intro. Donald Michie, University of Chicago Press, 1982. Frances Yates, "Ramon Lull and John Scotus Erigena", Journal of the Warburg and Courtauld Institutes 23 (1960), pp 1-44; repr. in Yates, Collected Essays, 1: Lull & Bruno, Routledge, 1982. Jocelyn N. Hillgarth, Ramon Lull and Lullism in Fourteenth-Century France, Oxford: Clarendon Press, 1971, xxviii+504 pp. Reviews: H.S. Offler (English Historical Review), Armand Llinares (Bulletin Hispanique, FR). Frances Yates, "Lull and Lullism", Times Literary Supplement, 2 Jun 1972; repr. in Yates, Collected Essays, 2: Renaissance and Reform: The Italian Contribution, London: Routledge, 1983, pp 79-84. Review of Hillgarth 1971 and Lullus, Quattuor libri principiorum, 1969. Ramon Llull and the Secret of Life, trans. James W. Heisig, New York: Herder & Herder, 2003, ix+277. Biography. Charles H. Lohr, "Nicolaus Cusanus and Ramon Lull: A Comparison of Three Texts on Human Knowledge", Traditio 59 (2004), pp 229-315. Florian Cramer, "Ramon Llull and Lullism", in Cramer, Words Made Flesh: Code, Culture, Imagination, Rotterdam: Piet Zwart Institute, 2005, pp 36-41. Anthony Bonner, The Art and Logic of Ramon Llull: A User's Guide, Brill, 2007. Alexander Fidora, Josep E. Rubio, Raimundus Lullus: An Introduction to His Life, Works and Thought, Turnhout: Brepols, 2008, xiv+564 pp. Review: Robert D. Hughes (Faventia), M.M. Tischler (Historische Theologie, DE). David Link, "Scrambling T-R-U-T-H: Rotating Letters as a Material Form of Thought", in Variantology 4: On Deep Time Relations of Arts, Sciences and Technologies in the Arabic-Islamic World and Beyond, eds. Siegfried Zielinski and Eckhard Fuerlus, Cologne: König, 2010, pp 215-266. Alexander Fidora, Carles Sierra (eds. ), Ramon Llull: From the Ars Magna to Artificial Intelligence, Barcelona: Artificial Intelligence Research Institute, 2011, 146 pp. Mnemonic Arts of Blessed Raymond Lull, a website by Yanis Dambergs devoted to aspects of the mechanisms from the Ars lulliana, including translations of several of Llull's works. Selection of images from 1515 edition of Arbor scientiae. The Thinking Machine: Ramon Llull and the «ars combinatoria», exhibition, CCCB, Barcelona, Jul-Dec 2016. This page has been accessed 19,915 times.